We developed a style crush on STUDIO LIFE/STYLE, ever since we saw their beautiful Mulholland Drive project on Instagram a few months back. 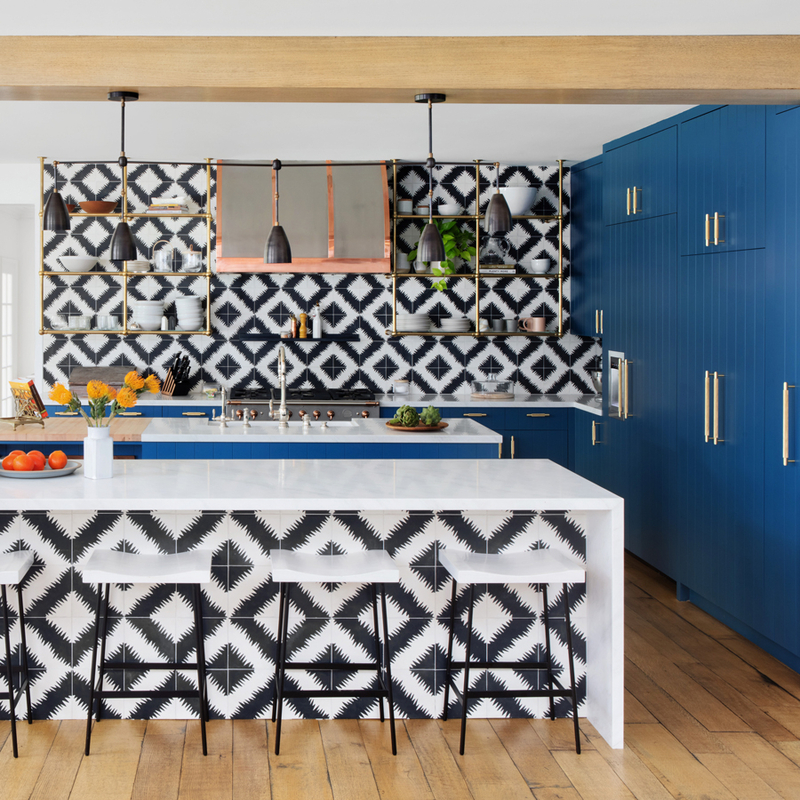 The show-stopping kitchen features navy cabinets, monochrome, oscillating tiles and Buster + Punch brass HARDWARE and was profiled in Better Homes and Gardens. Eager to learn more about West Coast interiors trends, we interviewed Shannon Wollack, Founder and Partner, and Brittany Zwickl, Partner and Principal Designer of STUDIO LIFE/STYLE. Please tell us a bit more about how STUDIO LIFE/STYLE came to be created? I had a background in the fashion industry that eventually evolved into wanting to be an interior designer. I met Brittany— who had just finished the interior architecture program at UCLA— after starting my own company nine years ago. We worked really well with one another right off the bat so we decided to start a business together! What was your first project together? Brittany and my first project was a remodel in Brentwood that was quite contemporary. It was a lot of fun tackling this project together for two reasons. First of all, we got to really bring the outdoors-in and the indoors-out, giving us a significant amount of versatility in our decisions and allowed the two spaces to interact with one another in a playful yet coherent way. Second, the client was a young female who gave us a ton of freedom— those are always some of the most fun projects for us! What have you learned about working with clients since then? We have learned that some clients are very hands-on while other are not. That being said, understanding how each client works and then tailoring our approach, is definitely one of the more challenging aspects of our job. That being said—each project is different. The way the client operates really dictates how we manage each job. What is the first thing you do when you receive a new brief? First off, we study the concept plans and pay close attention to the vision our potential client has for their home. After that, game is on and we hit the ground running. And by that we mean…we get inspiration images, pull together potential mood boards, present the clients with what we have gathered, and if the team and our client have a good rapport, we go for it! Is there anything unique about designing spaces for the west coast? Designing spaces on the West Coast is honestly a blast. We really embrace the indoor-outdoor feel where we can make all areas livable and useful. There are smaller plots of land to build on here, so we really have learned to maximize the space given to us as much as possible. This also comes into play as we take advantage of the increased natural lighting that is at our disposal. Do you have any interior trend predictions for summer and autumn 2018? We are predicting monolithic stone powder vanities, vintage leather chairs making a rise in popularity, unexpected and textured natural materials, and potentially, horse hair as an unexpected twist on how to cover or decorate upholstery, lighting, etc. Are there any materials, colors or objects you are particularly drawn to at the moment? We are really vibe-ing with organic, imperfect and natural textures and are currently loving yarn for knit surfaces and threaded throw cushions. We are forever drawn to leather wrapped goods and use them heavily— you can see some of them on our online shop!